The American criminal justice system is not perfect. Far from it. In fact, you can even say that the American criminal justice system is not just. The Exonerated tells the story of six wrongfully convicted people on death row using first-hand accounts, as well as court transcripts, letters, and interviews. We meet Kerry Max Cook, Gary Gauger, Robert Earl Hayes, Sunny Jacobs, David Keaton, and Delbert Tibbs. They start by telling us about their lives, about how things were before their lives changed forever. They take turns sitting in the spotlight and introducing themselves and the nature of the crimes they were accused of, with occasional and brief flashbacks acted out. They narrate what led up to it, about how they weren’t even close to the scene of the crime, yet they were accused and arrested and berated by police officers. They were all convenient victims as suspects for these crimes, tricked into confessing and easily disposable. Their harrowing experiences in prison, waiting for death row, was painful to hear. Listening to Cook’s account about how his imprisonment affected his older brother particularly stung, reminding us that these people, who aren’t even criminals, are still people, with families and feelings and a life outside of the prison walls even if we forget that. Sunny Jacobs’s gentle and innocent personality especially reminds us of their humanity, something that the justice system robbed them of but they managed to keep, even after the injustices they suffered. Eventually, they tell us how they were exonerated, but only after they paid the price with many years lost and many losses suffered. Andrew Cekala’s portrayal as Kerry, the fast-talking Texan, was very amicable and easygoing, just as Maddie Eaton gave Sunny a bright and sunny personality. Similarly, Jacob Smith as Gary, Chris Washington as David, and Lee Alexander as Robert all made their characters warm and distinct. Delbert Tibbs, portrayed by Mason Reeves, acted as a powerful narrator and common thread among all the stories, listening to Sunny’s account of her strength at the very end. The entire cast delivered a moving performance through all the nuances of their characters and their situations. All the characters remained onstage the entire play, sitting in their chairs on the side while listening intensely to the person in the spotlight whose story is being told. The simplicity of the set, with nothing more than a couple boxes and plenty of chairs, let us focus on the stories they were telling. The movement was also simple, the characters moving their chairs and shifting positions throughout the play, sometimes accompanied by the cast’s quiet yet powerful humming. The sound of the gentle rain and the shifting colors of the background gave a sense of growing uneasiness and eerie calmness at the same time. The stories of these wrongful convictions shows how the justice system fails its people, and it touches on race and the death penalty and how we need to rethink such things. This play is extremely thought-provoking and important to watch and even more important to remember. SMTD’s production of this documentary play reminds us how relevant and timeless this work is. 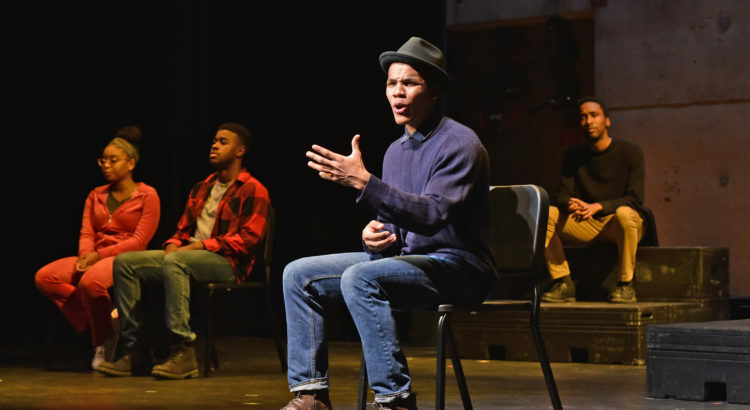 Though the sentences in the play took place during the 20th century, there are plenty of people still waiting to be exonerated today, and we walk away from this play with those people in mind.